Adolescence is a time of mental, physical, social, and emotional growth. It is during this time that higher levels of thinking, sometimes called executive function, develops. But adolescence can be a difficult time, fraught with challenges. During this time the child transitions to young adulthood; including the development of intellectual, psychological, physical, and social abilities and characteristics. There are so many changes occurring during this time that the child can feel overwhelmed and unable to cope with all that is required. Indeed, up to a quarter of adolescents suffer from depression or anxiety disorders, and an even larger proportion struggle with subclinical symptoms. Mindfulness training in adults has been shown to reduce anxiety and depression levels and improve emotional regulation. In addition, in adolescents it has been shown to improve emotion regulation and to benefit the psychological and emotional health. 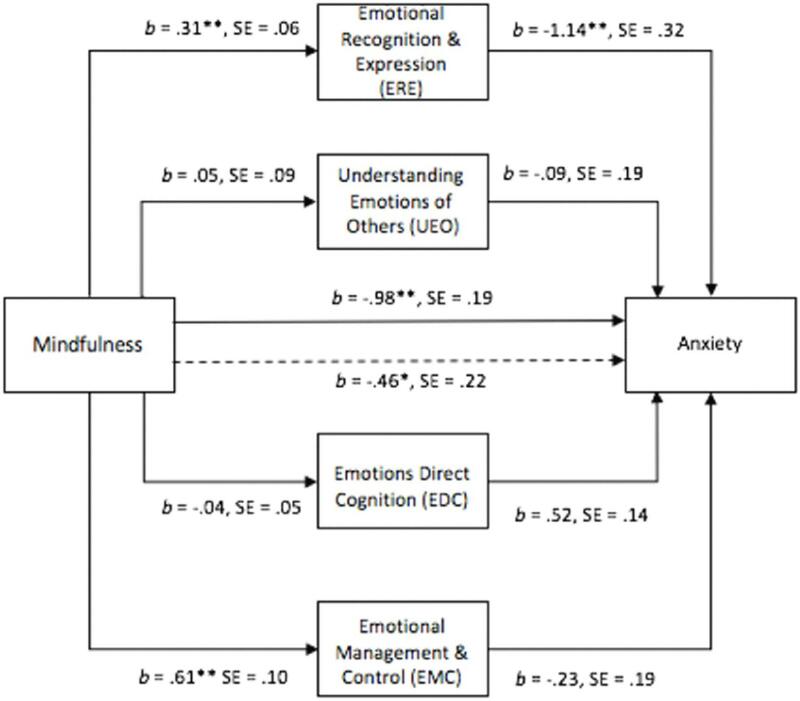 In today’s Research News article “Does Emotional Intelligence Mediate the Relation Between Mindfulness and Anxiety and Depression in Adolescents?” (See summary below or view the full text of the study at: https://www.frontiersin.org/articles/10.3389/fpsyg.2018.02463/full?utm_source=F-AAE&utm_medium=EMLF&utm_campaign=MRK_856297_69_Psycho_20181220_arts_A ), Foster and colleagues recruited 8th Grade students and had them complete an online questionnaire measuring mindfulness, anxiety, depression, and emotional intelligence, including subscales for emotional recognition and expression, understanding emotions, motions direct cognition, and emotional management and control. The data were then subjected to regression analysis. They found that the higher the levels of mindfulness the higher the levels of emotional intelligence, overall and all subscales, and the lower the levels of anxiety and depression. They also found that the higher the levels of emotional intelligence, overall and all subscales, the higher the levels of mindfulness and the lower the levels of anxiety and depression. Performing a mediation analysis, they found that mindfulness was associated with lower levels of anxiety and depression directly and also indirectly by its association with emotional intelligence which in turn was associated with lower levels of anxiety and depression. The study was correlational. So, no conclusions about causation can be reached. The results, however, suggest that adolescents are similar to adults in having clear relationships between mindfulness, emotional intelligence, and psychological health. Like adults, the adolescents’ levels of mindfulness and emotional intelligence are associated with lower levels of anxiety and depression. The results, though, also suggest that mindfulness’ association with anxiety and depression is partly by a direct association and partly indirectly through an association with emotional intelligence. This further highlights the fact that mindfulness is an important contributor to the development of an understanding of and ability to regulate emotions. It can’t be overemphasized how important this is for the adolescent in navigating the turbulent years of adolescence. So, mindfulness is associated with lower anxiety and depression in adolescents partly by higher emotional intelligence. High anxiety and depression are often observed in the Australian adolescent population, and if left untreated, can have long-term negative consequences impacting educational attainment and a range of important life outcomes. The utilization of mindfulness techniques has been associated with decreased anxiety and depression, but the underlying mechanisms for this is only beginning to be understood. Previous research with adult samples has suggested that the development of emotional intelligence (EI) may be one mechanism by which mindfulness confers its benefits on wellbeing. This study is the first to examine the relation between mindfulness, EI, anxiety, and depression in an adolescent population. It was hypothesized that EI would mediate the relationships between mindfulness and anxiety, as well as mindfulness and depression. The sample consisted of 108 adolescents from a public secondary school, aged between 13 and 15 years (Mage = 13.68, SDage = 0.56, 51 males and 57 females). Participants completed an online self-report questionnaire which measured dispositional mindfulness, EI, anxiety, and depression. 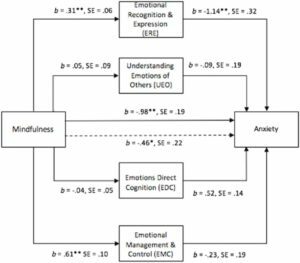 The results indicated that one subscale of EI – Emotional Recognition and Expression (ERE) mediated the relation between mindfulness and anxiety, while two subscales of EI – ERE and Emotional Management and Control (EMC) mediated the relation between mindfulness and depression. Future research utilizing a mindfulness intervention should be conducted to examine whether the use of mindfulness increases EI and decreases anxiety and depression in adolescents.